A beautiful, modern alternative to traditional paving, Geveko (formally Adbruf Ltd.) Marking’s resin surfacing products have increased in popularity for use in public spaces, commercial and retail areas, domestic driveways and paths. 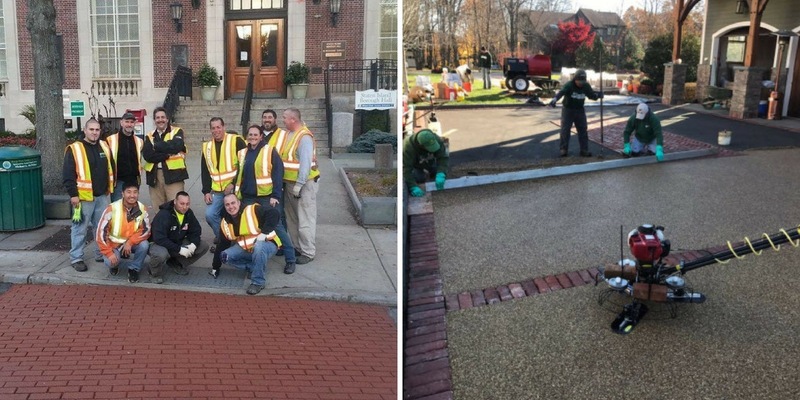 Using our extensive knowledge and experience, in resin paving paving systems, CompleteStreetsUSA, offers US customers a resin training course. You receive in-depth knowledge of resin binders, on-site safety and application, including hands-on experience with both the bound and bonded materials. A clear understanding of what resin systems are and the difference between resin bound (trowel-applied) and resin bonded (broadcast). Advice on PPE and health and safety on-site. An in depth knowledge of how to prepare a surface ready for installation. An insight on how flexible resin paving is when creating stylish and decorative surfaces. An awareness of the issues that you may face when approaching an installation and how to best deal with them. Hands-on training, offering a feel for the products and experience in laying both Adtex and GeoPaveX systems.